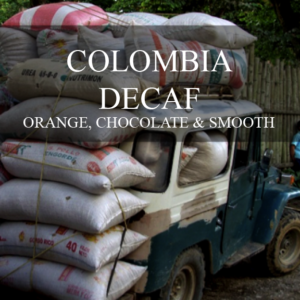 Our two Colombian coffees are great quality, coming to us from our friends at Cafe’ Imports (One of the most respected coffee importers in the nation). The Colombians come from community farms. 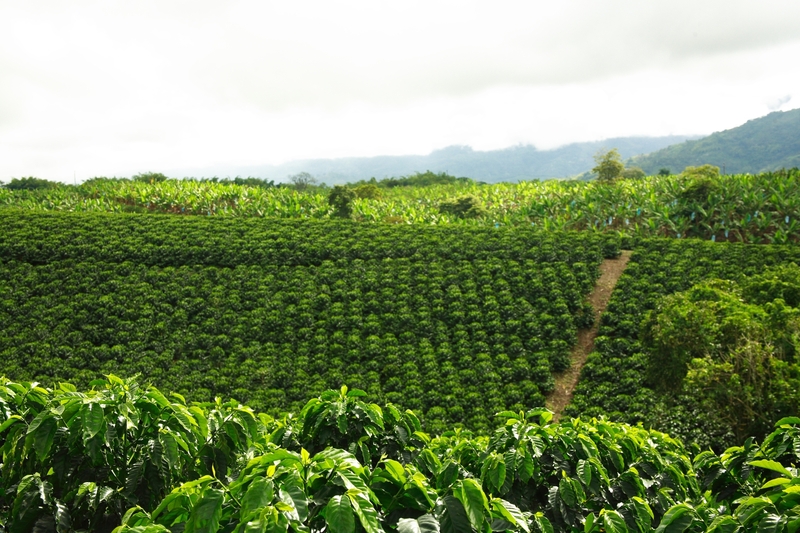 Each farmer has a region of approximately six acres in which they pick, pulp, ferment and dry their coffee on raised beds. The farmers all work coherently together to ensure they have a similar style and quality. The coffee from these farms is often grown to be big, juicy cherries that exude a caramel, chocolate, and acidic flavoring. 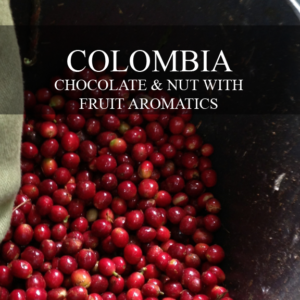 Colombia is a great area to farm due to the terrain, soil, and weather on top of the overall climate and it really brings out the playful flavors you’ll hear about below (and be able to taste after your order!) When the farmers come together, they select the best coffee by cup, then blend them together almost how a wine or local honey is cultivated together. The farmers depend on each other to be equal so decisions are made as a team and not by individual farmers to ensure only the best quality. 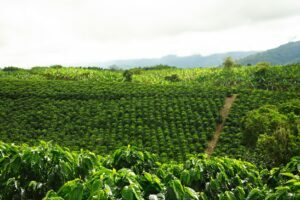 The altitude of these farms can range from 1400 to 1900 MASL and the farming community is approximately a four mile radius. I brewed the Colombia using my Chemex, weighing out the coffee and water. Click here to learn how to use a Chemex via a video with Chris – I have long said the Chemex is my favorite brewing method, as it is known for bringing out a clean, depth of the coffee that is being brewed. My first sip brought out chocolate depth, which then was accompanied by a nutty fruitfulness. The colombian “coffee strength” I expected really exploded on my taste buds and the taste stayed true and strong. It was a great pick me up cup of coffee. I was surprised at the tone of the chocolate, as it was not overpowering to the cup, but kept a unique intensity, while the nutty fruit really embarked as the perfect compliment. WAIT A MINUTE… Don’t skip this part. If you aren’t a fan of DECAF, I want you to know that I was right there with you. I scoffed at the notion of the taste, doubted the process, and had a lot of false ideas about what DECAF was. I’ve always seen decaf coffee similar to how Diet Coke is to Coca-Cola. I have to admit that I was clearly wrong! I was very curious to see how the decaf compared to the regular, so I brewed the decaf with the Chemex as well. I was looking to see how a decaf’s mannerisms were in comparison to the regular, and as far as brewing went, I found no differences. After I brewed and poured myself a cup, I found that this was a very easy, enjoyable cup of coffee. It has a bold chocolate flavor with a pleasant undertone of orange. It is delicious! The cup I brewed never lost its zing, but maintained a simplicity in its taste. I would have never known it was decaf, as I actually drank a second cup (despite already having numerous cups that day). This is a coffee that I really believe in – It really jolted my perception of decaf and, with a little research I’ve been working on, has me questioning why so many people are so negative to decaf without giving it a fair shot. After completing my taste test, tt was no surprise to me why we eagerly picked each of these coffees. We definitely got the Colombian pedigree we were looking for and couldn’t be happier with how these brew, smell, and taste. The roast Adam created for them really completed the process the farmers started, bringing out the profile perfectly, and I’m eager to get these into your hands so you can get brewing. Are you still doubting my “decaf” revelation?? Fair enough. Here is what I want you to do… Click on the box below and sign up for our email list. Over the next few weeks we will be launching a “Decaf – Fact of Fiction” discussion and you aren’t going to want to miss out! I KNOW you want to throw your 2 cents in on this topic! In the meantime, stop thinking about decaf as the monotone coworker you have to spend your day with… Start to think of decaf as that intellectual entrepreneur you’ve been dying to get to learn from. It all starts with the change of thought… And certainly its time to give decaf a fair “taste”.